Kim is an artist and her canvas is the face. She is a New York City native with a Bachelor of Science degree in Community Health from Hofstra University. Kim has always had a passion for health, hence her tertiary education; however, her true passion for beauty sprung while pursuing her college degree. Knowing without good health, beauty can’t thrive well, Kim combined the knowledge learned through her education with her passion for all things beauty to create launch Makeup by Kim Porter and Beauty and the Bump blogs. Kim is a self-taught makeup artist, and as a child, Kim loved to play with her mother’s makeup and in high school she would always peruse the makeup counters and purchase a few items. Kim always took time out everyday to perfect her craft by teaching herself how to apply the makeup, taking various makeup master classes, assisting other makeup artists, watching YouTube instructional videos, and using her willing friends as models to see what worked and what did not. As a woman of color, and a consumer, she knows first hand how difficult it is to locate the right cosmetics and artist; without searching high and low and spending an obnoxious amount of money on finding the right shade. As a freelance artist, she understands the puzzlement and lack of education women of color have, in terms of the correct application of makeup. There is a science to the art of correctly applying makeup and putting one’s best face forward that, Kim has first hand knowledge of. 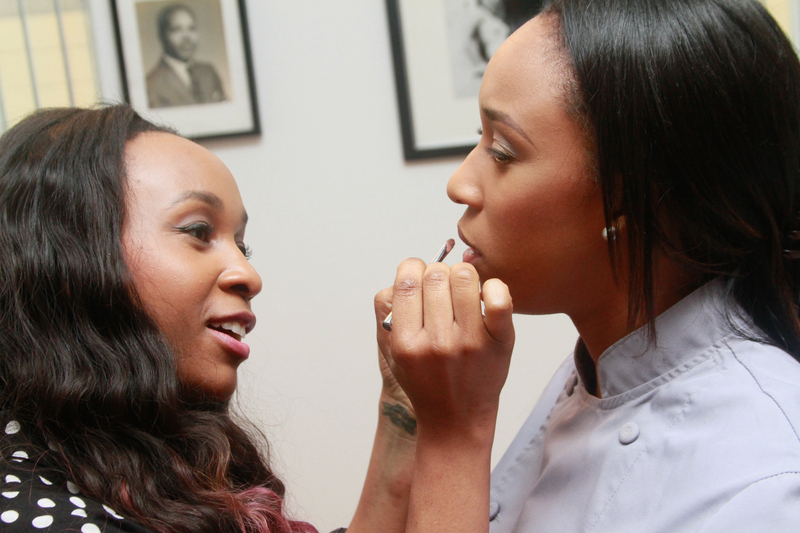 Porter has launched a Blog and a Youtube instructional channel, through these she hopes to reach a wider audience and provide the African-American community with a virtual hands-on guide to putting their best face forward. The most important element of Kim’s work is to be able to use her creativity to enhance natural beauty, yet bring out a person’s inner beauty and individuality.